My early memories of Gli Azzurri coalesce around Roberto Baggio. How could they not? During the 1990 World Cup he was 23 and jostling for preeminence; four years later, it seemed that he was doing the same. Absurdly. Criminally. It was June 23, 1994. Ireland's Ray Houghton had condemned Italy to defeat in the first group game, so they were playing Norway in a must-win encounter. The early signs were promising. Coach Arrigo Sacchi fiddled with his methods, switching from two forwards that he had used against the Irish to three against Norway: Baggio, Pierluigi Casiraghi, and Giuseppe Signori. He also brought on Inter's Nicola Berti in place of Sampdoria's Alberigo Evani in midfield. Italy seemed on the verge of a goal until the 21st minute when goalkeeper Gianluca Pagliuca rushed off his line and fouled a Norwegian player. He was shown a red (later he joked that "at least I entered history"). Lazio's Luca Marchegiani stood up to replace Pagliuca. The question was which outfield player would come off. Sacchi opted for Roberto Baggio, the coach slipping seamlessly and callously into the role of anti-hero. Baggio looked around, scanning his teammates for an answer. "Who me?" he asked them, totally bewildered. It was to be him. Baggio came off. Sacchi would stand with the weight of his decision on the sidelines for the rest of the game. It would get even worse. Captain Franco Baresi came off in the 49th minute with a knee problem, the less illustrious Luigi Appolini taking his place in defence. Whatever could go wrong for Italy had. Sacchi had removed the man the press and the fans adored; a suspect knee had removed the defensive stalwart. Italy toiled for a goal in the Giants Stadium of East Rutherford, New Jersey. It came from Baggio, finally. No, not the one watching from the sidelines, but from one who wasn't even related to him. It was Dino Baggio, the lanky Juventus midfielder. He rose to meet a Signori free-kick, delivered with sumptuous precision, to smash a header past the Norwegian goalkeeper. There were still more than twenty minutes left to play, but you had the feeling that Italy had done what they needed to. And so it proved. Baggio, Dino, not Roberto, ensured the victory. Sacchi's decision to take off Baggio, Roberto, not Dino, didn't prove as costly as feared. At the time, I was fifteen. 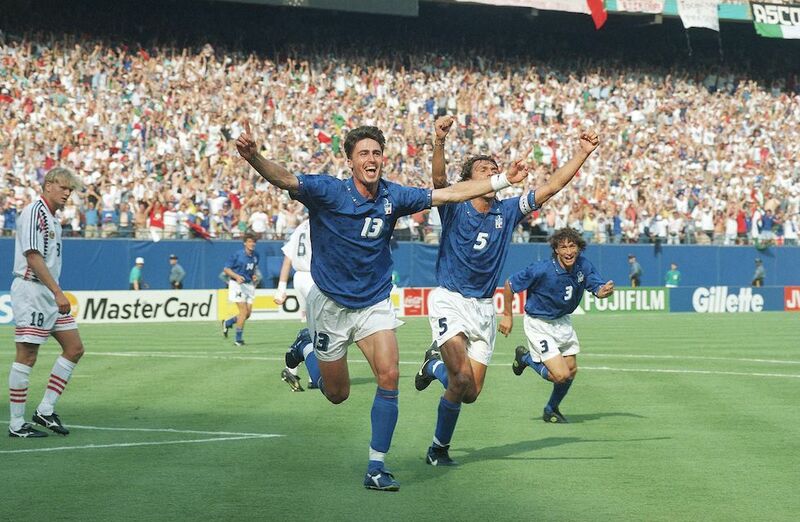 I just remember my joy at Dino scoring, and I remember my anger at Roberto trudging off. I wasn't aware then of the broader debate. English language broadsheets stripped the national significance of the Baggio substitution; they could never capture the recrimination in Italy. It is only with the benefit (or drawback) of hindsight that I can now put into context all that was going on. Articles. Books. Videos. My ability to speak Italian. All these things at once enrich and dilute my memory of that day. Even the audio in my head has been replaced by commentator Bruno Pizzul's voice faltering at the substitution, before rising again at the goal. The Sacchi-Baggio subplot now colours almost everything. But the victory remains unadulterated. The essential Italian victory, on this day, twenty-four years ago.